Reading and share top 9 famous quotes and sayings about Mitochondria by famous authors and people. Browse top 9 famous quotes and sayings about Mitochondria by most favorite authors. 1. 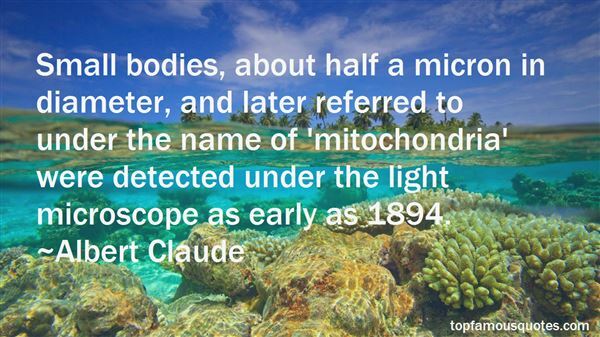 "Small bodies, about half a micron in diameter, and later referred to under the name of 'mitochondria' were detected under the light microscope as early as 1894." 2. "School you may have learned the basic components of a cell: the nucleus that contains genetic material, the energy-producing mitochondria, the protective membrane at the outside rim, and the cytoplasm in between." 3. 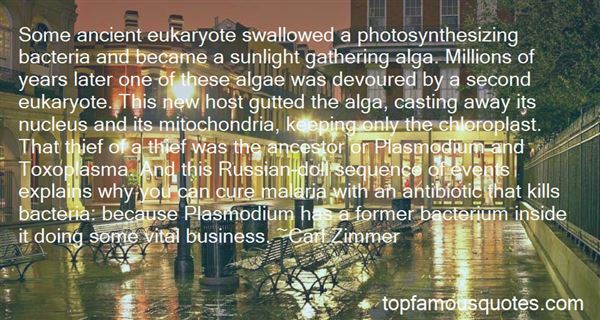 "Some ancient eukaryote swallowed a photosynthesizing bacteria and became a sunlight gathering alga. Millions of years later one of these algae was devoured by a second eukaryote. This new host gutted the alga, casting away its nucleus and its mitochondria, keeping only the chloroplast. That thief of a thief was the ancestor or Plasmodium and Toxoplasma. And this Russian-doll sequence of events explains why you can cure malaria with an antibiotic that kills bacteria: because Plasmodium has a former bacterium inside it doing some vital business." 4. "Cooks were the mitochondria of humanity; they had their own separate DNA, they floated in a cell and powered it but were not really of it." 5. "My mitochondria comprise a very large proportion of me. I cannot do the calculation, but I suppose there is almost as much of them in sheer dry bulk as there is the rest of me. Looked at in this way, I could be taken for a very large, motile colony of respiring bacteria, operating a complex system of nuclei, microtubules, and neurons for the pleasure and sustenance of their families, and running, at the moment, a typewriter." 6. "Metabolically active cells, such as those of the liver, kidneys, muscles, and brain, have hundreds or thousands of mitochondria, making up some 40 per cent of the cytoplasm. The egg cell, or oocyte, is exceptional: it passes on around 100000 mitochondria to the next generation. In contrast, blood cells and skin cells have very few, or none at all; sperm usually have fewer than 100. All in all, there are said to be 10 million billion mitochondria in an adult human, which together constitute about 10 per cent of our body weight." 7. "Matters came to a head after 1918, when the French scientist Paul Portier published his rhetorical masterpiece Les Symbiotes. He was nothing if not bold, claiming that: ‘All living beings, all animals from Amoeba to Man, all plants from Cryptogams to Dicotyledons are constituted by an association, the emboîtement of two different beings. Each living cell contains in its protoplasm formations, which histologists designate by the name of mitochondria. These organelles are, for me, nothing other than symbiotic bacteria, which I call symbiotes." 8. "This was difficult to prove as most hydrogenosomes have lost their entire genome, but it is now established with some certainty.1 In other words, whatever bacteria entered into a symbiotic relationship in the first eukaryotic cell, its descendents numbered among them both mitochondria and hydrogenosomes." 9. "Rather surprisingly, to anyone who is most familiar with textbook mitochondria, many simple single-celled eukaryotes have mitochondria that operate in the absence of oxygen. 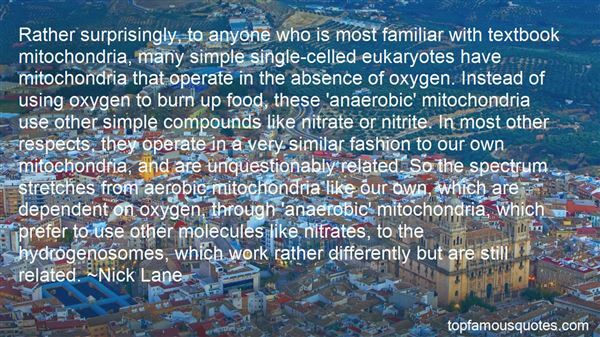 Instead of using oxygen to burn up food, these ‘anaerobic' mitochondria use other simple compounds like nitrate or nitrite. In most other respects, they operate in a very similar fashion to our own mitochondria, and are unquestionably related. So the spectrum stretches from aerobic mitochondria like our own, which are dependent on oxygen, through ‘anaerobic' mitochondria, which prefer to use other molecules like nitrates, to the hydrogenosomes, which work rather differently but are still related." My audience was my life. What I did and how I did it, was all for my audience."